Well, there have been a few changes to my Tuesday view since last time, two weeks ago. The garden held up well to the heat at the end of August and has been enjoying a little respite over the past few days, with cooler temperatures and quite a bit of rain. 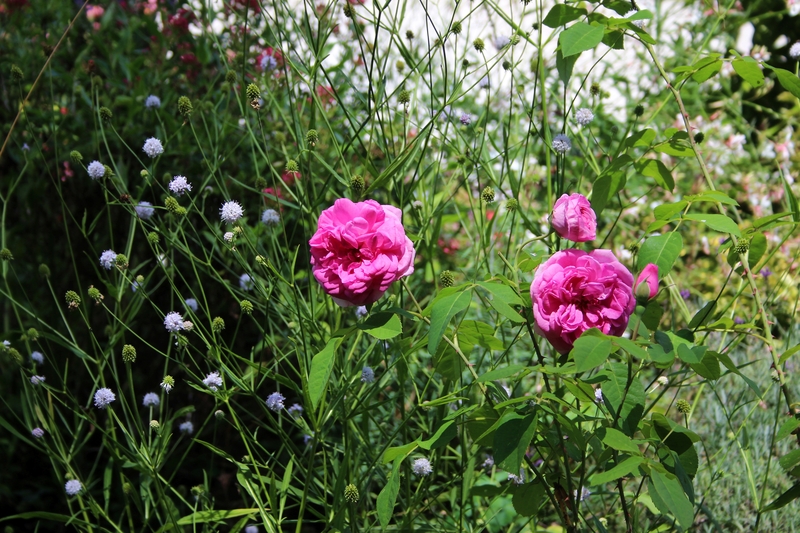 …and my pink rose Gertrude Jekyll has finally produced more than just one flower at a time after barely flowering at all earlier in the year. I like the effect next to the Succisella. The Gaura lindheimeri (‘Summer Breeze’) at the top of the rockery has also filled out well and is producing lots more lovely pale pink/white flowers. I think the name so appropriate as it sways gently in the slightest puff of wind, even on a very hot day, making me believe there is a cool breeze! Gaura is not always hardy in our climate, but this one seems to have got established, with its roots nicely protected under the Golden Euonymus. If you would like to join me in following one view of your garden week by week to observe the changes as the year progresses, please leave a link below. This entry was posted in Garden, Nature, Tuesday View and tagged Garden, Nature, Seasons, Summer, The Tuesday View. Bookmark the permalink. It’s looking great and refreshed by the change in weather, so many contrasting colours and textures. Perfect! Thanks Kate. These weekly shots are a great record for future reference and winter plans! Exactly, it’s so easy to overlook/forget the highs as well as the bits that can be tweaked. Wow…it is full and lush! So much color and blooms. I like the idea of guara swaying and giving the sense of a breeze! It is feeling really autumny today, but is so lovely and warm again… and the mosquitoes have gone at last! Beautiful. Love your Russian sage. Mine is wild and unruly … very different from the tidy samples pictured in catalogues. I love the swooshy wave form yours has taken. I think Russian sage looks tidy for exactly three and a half minutes each summer! And that’s when they take all the catalog pictures! It is looking good Cathy, you have so much late summer colour. Thanks Chloris. I hope this warm weather continues… let’s say until November! Then the garden can keep on producing flowers for a while! What a refreshing view, it really does look as if it enjoyed the cooler weather and those reds absolutely glow in the lower light. Hi Frank. 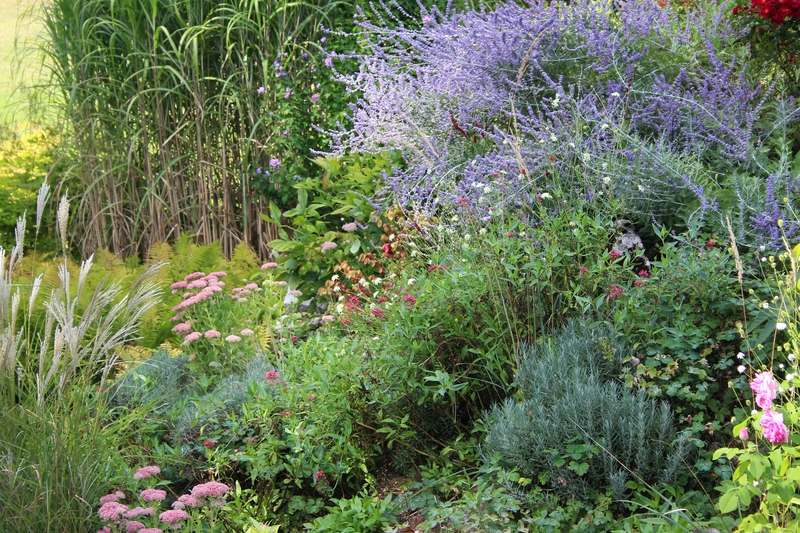 It’s warm and windy now, so although the heat has gone some plants will need watering again soon. Those in this view though never get any extra water from me, so that is quite satisfying, and at this time of year I can just sit back and enjoy it! I liked your comment about “Summer Breeze,” Cathy. So often just staring at the garden and appreciating what is alive and thriving can bring a lightness to my spirit and add a gentle breeze, even in high heat! Your garden is really beautiful for this late in the summer. I’m quite impressed with all that wonderful color! 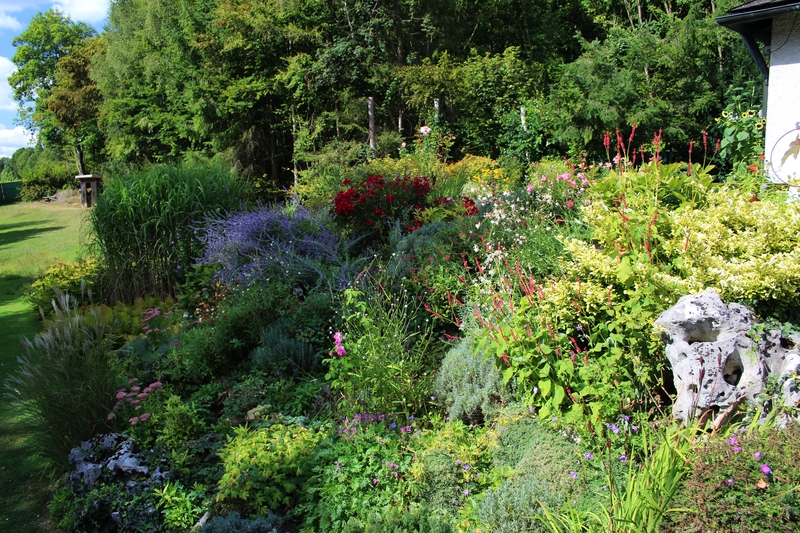 Your garden is a beauty in September! It does look different, the rain makes it look very fresh again. We arrived home last evening, I took some photos this afternoon so I hope to join you tomorrow, a bit late but never mind. It has been very warm and windy here today, which made me think of you and your climate. Look forward to seeing your view again. 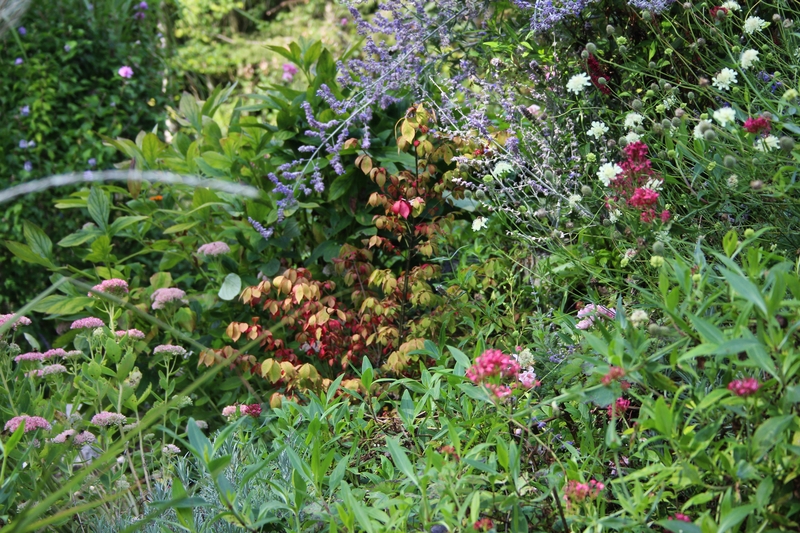 It’s fascinating to see the extra burst of bloom as autumn comes – love the effect of the sedums! 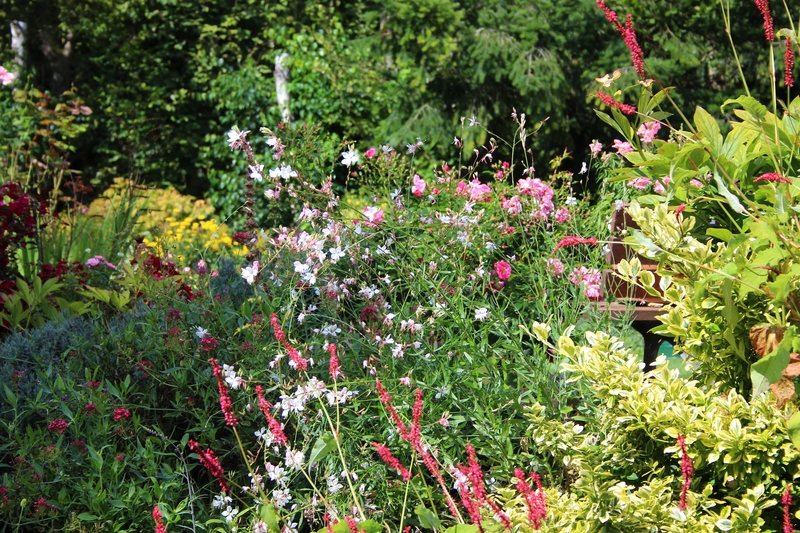 And the gaura – I feel the same about mine, always picking up any little breeze and bringing movement to the garden! Things have really changed since two weeks, there seems to be more color and blooms. 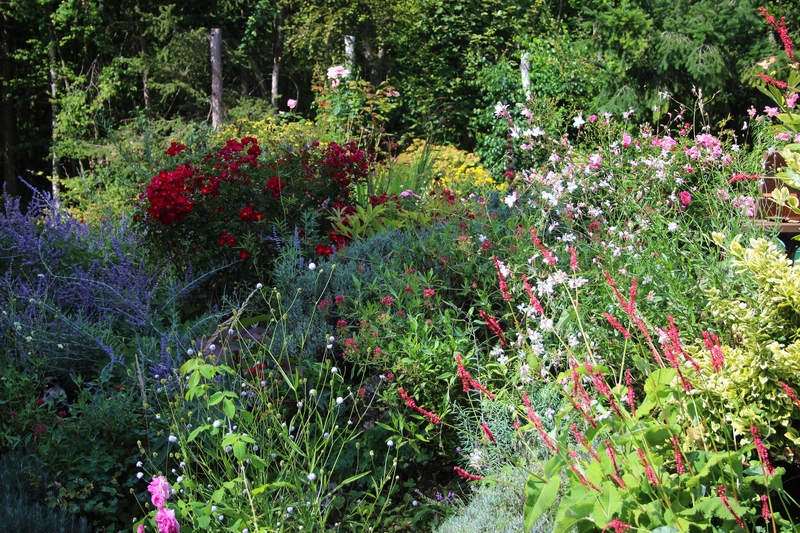 Seeing your garden makes me want to run to the nursery – very inspiring! It looks vibrant and healthy. Interesting to see the subtle effect of the sedum flowers in the picture too. Cathy, your view just gets better and better. Everything looks richly colored and healthy. I can’t bear to look at my garden these days. We just walked around the garden and were saying how it is so different this year after all the rain we had in spring and early summer. Many plants that I usually have to cut down in July are still looking fairly green, including the ferns in the full sun! Looks good! Love all the red and pink. Yes, the roses are still blooming like mad!